Elmartin Farm ("The Farm" or "Elmartin") has a Beef Program designed for a person/s or group/s who wants to raise their own beef for taste, for knowing how it is raised, and optionally for a business; i.e. one can resell their end product with or without the assistance of Elmartin Farm. Recognizing that most people who desire this program (Owners) are not farmers / ranchers, Elmartin has tailored the process so that Owners can enjoy elements of raising their own beef without having to toil in the process. In short, Owners have title (full or partial depending upon the arrangement with Elmartin Farm) to the livestock. Either way, Elmartin Farm cares for it. In business parlance -- if one is attracted to this program as a business -- Elmartin operates your business and provides progress reports to you for your management, inspection, and consultation regarding extra feeding options, time to sell, auctions, USDA inspected slaugter facilities, transportation, other beef breed options, herd expansion at the farm, and more. Our beef cattle range freely on grasses. Depending upon the desire of owners, a program can be se in place to provide grain finishing as well. SEE PRO FORMA AGREEMENT FOR DETAILS. Below is offered as a quick synopsis. Only a signed agreement is binding. INTERESTED PARTY PROVIDES LOAN TO FINANCE AN ANIMAL OR HERD TO BE OWNED BY ELMARTIN FARM. THE LOAN INTEREST IS NEGOTIATED DEPENDING UPON THE COMMITMENT. PRINCIPAL AND INTEREST IS GUARANTEED BY THE LIVESTOCK OR BEEF, ITSELF. Option One is as straight-forward promissory note plan. 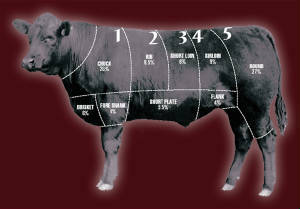 It is an EXCELLENT first step into the understanding of cattle raising and beef production. Though not owners, lenders are afforded the same information and courtesies as owners. Option Two is a risk/reward ownership plan. It carries the rewards potentially generating more revenue on a per dollar basis than Option One; however, it carries the very same risks that confront owners of livestock everywhere. There also are active/passive tax considerations around which Elmartin structures the arrangement. Potential owners are responsible for discussing these tax laws with their accountants or tax lawyers. 1) The Farm houses, feeds, and cares for animal/s for a daily fee to be determined, billed monthly by credit card base one a set 30 day month. 2) The Farm will use its customary, sound practices to provided a safe area for animals to grow. includes acts of nature such as lightning and other ways such as vehicular accidents either on the road or via vehicles leaving the road. 4) The Farm arranges for finishing. 3) Pays for insurance should the Owner decide to insure his/her investment. Monthly Fee: __________________ The Fee is reviewed and/or adjusted monthly, if necessary, to reflect increases in feed prices. The Farm will locate and purchase a suitable calf or calves for the client who provides $_______ up front for each animal. ( Prices range around $500 but vary dur to breeding, market demand, and calf's age.) Should less be required, the balance remaining will be applied to monthly charges. Any higher variation in the purchase cost shall be settled at the time the animal is brought to Elmartin Farm.